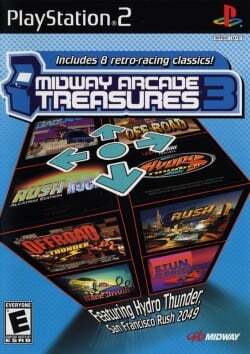 Game description: Relive eight of Midway's classic arcade games in Midway Arcade Treasures 3. The game includes both single-player and multiplayer action. You can post your high scores via Xbox Live to see if you measure up to the best in the world. The games include: Badlands, Hydro Thunder, Off Road Thunder: Mud, Sweat, N' Gears, Race Drivin', San Francisco Rush The Rock: Alcatraz Edition, San Francisco Rush 2049, S.T.U.N. Runner, and Super Off Road with the Bonus Tracks Pack. This page was last edited on 3 February 2017, at 21:14.